Sugar, pistachios, flour, ghee, starch. You can spot Balourieh in an assorted sweets arrangement from a distance: It is the white piece glowing at you. It gets its characteristically white glowing color from the fact that it is very lightly baked and its dough is kept almost raw. The added sugar syrup gives it its shiny look. It is the only piece among all assorted Baklava types that is kept almost raw. In fact, it is baked for only about five minutes. Balourieh was originally invented in the Syrian city of Aleppo (Halab). Pronounced [ba-lu-ree-yeh], it comes from the Lebanese word for “Glow”. It is thus named because of its unique white color and glowing texture that differentiates it from all other types of dessert. 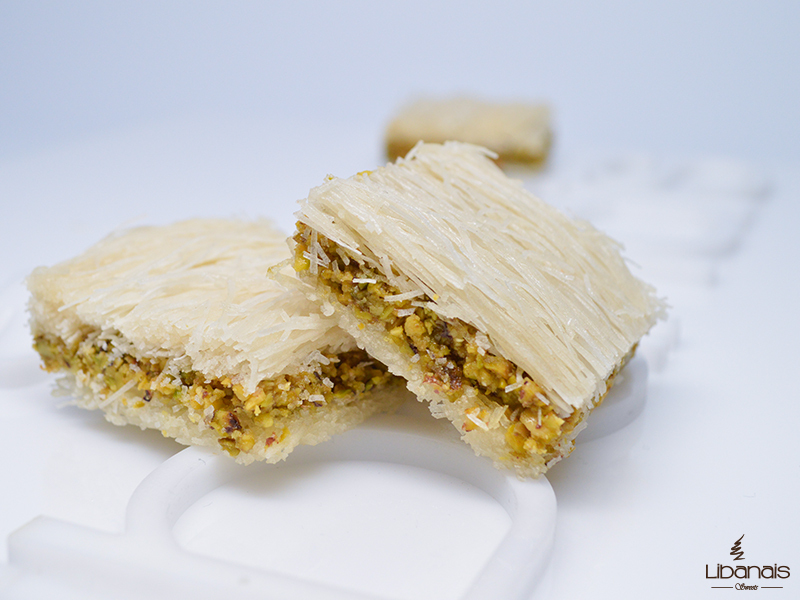 First, the stringy Knafeh dough and the sugar syrup are prepared, then layers of stringy dough and pistachio filling are stacked and lightly baked. Balourieh is made from a dough similar to Knafeh dough but that consists of starch in addition of flour and water. To prepare it, flour, starch, and water are mixed for about four hours to form a watery mixture. Then the mixture is poured into a special container that contains small holes in its base and placed on top of a hot surface. As the watery dough mix passes through the holes, it forms filaments of dough. The container is moved along the hot surface as the dough mixture drains through the container to form long strings of dough. The strings of dough are then let to dry, and voila, you got the stringy Knafeh dough. After the ghee is spread over a baking sheet, strings of the previously prepared dough are laid. A layer of the filling made of pistachios and sugar is added on top of the dough, then a second layer of stringy dough is placed on top of the filling. This results in a layer of pistachios sandwiched between two layers of dough. In order to keep the filling and the dough from coming apart, a very heavy weight is placed on the raw Balourieh for about 10 hours. Balourieh is initially baked for only three minutes on medium temperature. Then a small quantity of sugar syrup is added on top of it, and it is flipped over and baked for another three minutes. After baking, it is cut into square pieces and sugar syrup is added on top. Balourieh is served as a dessert, usually as part of assorted Baklava arrangements. Like most Middle Eastern sweets, Balourieh is most famous in Lebanon, Syria, Palestine, and Jordan but its reach has spread to the entire world. Balourieh is one of the assorted Baklava types that are made with knafeh dough. Assorted baklava desserts are made of two forms of dough: Paper thin sheets of phyllo dough or thin strings of dough called knafeh dough.